You may not know my background, but I was born again when I was eight years old-I really loved God. I started serving Him, and basically what I was told was that God would love and respond to me as long as I was holy. So, when I was eleven years old and my dad got sick, I prayed and fasted, asking God to heal him. Right after I turned twelve, he died, and my pastor told me that God needed my dad in heaven more than I needed him. I interpreted this to mean that I just wasn't holy, or good, enough to see him healed. So, then I really began to try to earn God's favour. And relative to other people, I lived a holier life than anybody I knew. I spent more time praying, studying the Word, and witnessing. But my faith was in my goodness. You see, I had taken one truth to the extreme, or to the exclusion of other truths. I was out of balance and didn't even know it! Then, on March 23, 1968, God revealed His standard of holiness to me, and I saw just how unworthy I really was. I began confessing my sins and self-righteousness, expecting God to kill me, because that is what I had been taught. But instead of judgment, all of this supernatural love came flooding through me. In an instant, my legalistic theology was ruined by the love of God. I have never been the same since. I could spend a lot of time talking about how that experience affected me, but I wanted to share this with you to illustrate how the situation I was in is typical of many, if not most, Christians. They've never realized that God loves them not because they are lovable but because He is love. It is totally an act of grace. But it won't manifest in their lives by God's grace alone. Grace has to be mixed with faith to receive this love. It's the same with you. God loves you much more than you could ever dream, but if you're going to experience and live in His love, that's going to take faith on your part. If you don't operate in faith, it doesn't change God's attitude toward you, but you'll be confused, frustrated, and even disappointed like I was. I tell you, this has transformed my life and the lives of thousands of others. You need to learn to combine two of the most essential components of the Christian life--grace and faith--if you're going to walk in balance. 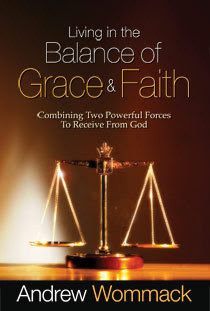 My teaching Living in the Balance of Grace and Faith will show you how. These are principles from God's Word that you need for everyday life, and it's the very first book I ever produced! In this teaching, I deal with questions such as "What is God's part, and what is my part?" "Is it up to me to get this done, is this something God has already done, or is it a combination of the two?" and "How do I respond and receive what God has already provided?" Those are big questions, and sadly, most people are not answering them correctly. This teaching is available as a book in multiple languages, a study guide, a CD series, and DVD series. These materials would really be a blessing to you. To order, go to www.awmc.ca, or call our Canadian Helpline: 647-348-2220.